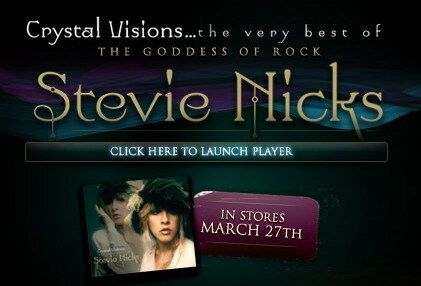 NIGHT OF A THOUSAND STEVIES is the biggest and best-loved STEVIE NICKS fan event in the world, one of those great New York City spectacles that sparks travel from all around the globe. Born in 1990 at the tiny performance venueMOTHER, "The Night" has run for seventeen years, even inspiring the 2001 film GYPSY 83. Neither a contest nor a karaoke show, NOTS is a riot of shawls, lace, baby's breath, twirling, tambourines and great performance. This much-loved annual has hosted Stevie fans and celebrated guests including DEBBIE HARRY, BOY GEORGE, COURTNEY LOVE, CYNDI LAUPER and so many more. Select the image size below the photo that best fits your video resolution settings. When the image is displayed, right-click it and select "Set as wallpaper" (Netscape) or "Set as Background" (Internet Explorer and AOL).